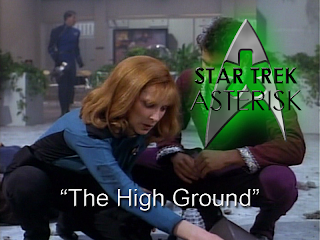 Star Trek: Asterisk "The High Ground"
Dr. Crusher becomes sympathetic to the rebels after suffering a mild case of Stockholm Syndrome. We learn right from the captain's log that things aren't right on Rutia IV. After a generation of peace, they're suffering from terrorist attacks from rebels who wish to gain autonomy. So it's no big surprise when a bomb goes off in the middle of the town and the rebels start kidnapping, but what's a little more surprising is who they kidnap. Rutia IV is not aligned with the Federation, so it's odd that they would kidnap Dr. Crusher, who has nothing to do with their fight. It's not like they could us a competent doctor or anything, right? What's a little more unusual is their method of travel. They seem to have just disappeared into nowhere without a trace of a transporter beam, and even Data can't figure out where they'd gone. Meanwhile, Finn, the rebel leader, introduces himself to Beverly, but she refuses to speak to him. And Picard and Riker try to talk to Devos, the head of Rutian security to find out who they're dealing with. They seem to be at a stalemate until Beverly starts talking when Finn feeds her a second time. That's when Finn reveals that he needs her to help cure his rebel friends and he has no intention of harming her. Although, he may harm your hair. Well, it turns out that the rebels have been using dimensional shifting to get around. We learn from Beverly and from the people on the Enterprise that this kind of technology is really dangerous and is the cause of the sickness that has been plaguing the rebels. The only thing Beverly can do to treat the sickness is to recommend they stop using the technology. Well, that's not gonna work for Finn because he has at least one more demonstration to run before his whole agenda is over. And in the meantime he really wants to make Beverly understand the rebel plight. It seems to be working. Apparently he knows all about Earth history, and he compares himself to George Washington, saying that the only difference between terrorism and revolution is who wins. But, then, I'm not sure George Washington would blow up a random French ship just to get England's attention. And that's basically what he plans to do: blow up the Enterprise. Finn takes a group and dimensionally shifts over to the Enterprise. They run amok for a while and then plant a bomb in engineering. When Picard tackles Finn, he shifts back to the rebel hideout and now they have Picard. A totally legitimate tactical maneuver. Fortunately for the Enterprise Wesley has discovered a way to track the shifts and is able to report where they've gone. Turns out it's in a cave far below the city without any physical entrances or exits. The only way down is to shift or to transport. At least Picard and Beverly are together now, though, right? And while they talk, Picard learns that Beverly has gained a little sympathy for the rebels. That'll never do, so Picard tries to keep her grounded in what's really going on. That Finn is killing people. That he planned on destroying the Enterprise. Now it's the Enterprise's turn to fight back. 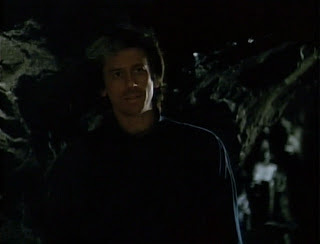 Riker organizes a team and then talks to Devos to tell her where the rebels are. After they get a plan of action, they take Devos and beam down into the cavern to an area where no one happens to be at the moment. The sneak up on the first to rebels they find and then figure "to hell with it" and start shooting the place up. 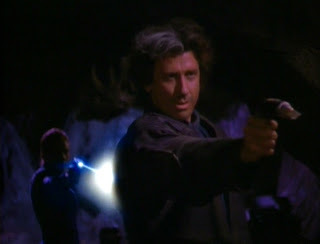 In all the chaos, Finn runs to Picard and Beverly attempting to make his one final act of terrorism killing Picard. But, in stead, Devos shoots him from behind. Devos defends herself by saying if he was a prisoner he'd be a focal point for violence as the rebels try to bust him out. This way, while he may be a martyr for their cause, at least the violence will subside in the short term. "An imperfect solution for an imperfect world." Meanwhile, a small rebel child points a gun at Devos, but Riker talks him down, signifying that it is perhaps the beginning of the end to this bloodshed. All things straightened out, the Enterprise crew beams back to the ship and Beverly and Wesley have a mother/son moment on the bridge. As they hug, Picard tells him to take them out of orbit... at his leisure. I can't help but make a parallel here to the recent bombing in Boston and the latest trend in America to fight terrorism. This episode is a reminder that violence is not the best answer, although it may have been the only answer in the past. In an advanced society, we can learn to negotiate without violence, so let's try to move forward, not backward.